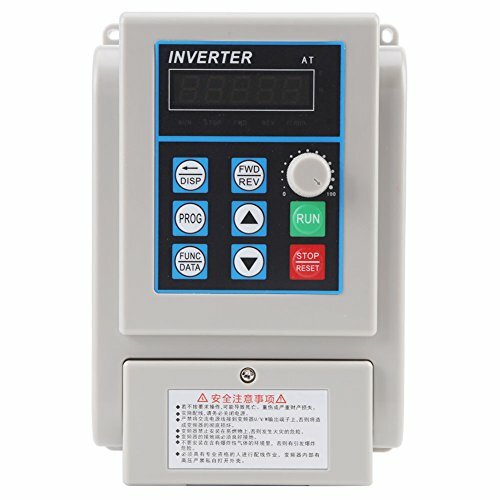 This VFD uses unique control method to realize high moment of force, high precision and wide speed regulating range driving, with high performance. It has good anti-trip performance and ability to adapt to rough power, temperature, humidity and dust interference, greatly improved stability. By optimizing PWM control technology and electromagnetic compatibility, it satisfies users' requirement of low noise, low electromagnetic interference. Simple to operate and wire, connect to wires by screw terminals which are more convenient. Designed with large heat sink for better heat dissipation. Note: When adjusting parameter, the VFD must stop working, otherwise it will not be able to save parameter setting.